Ted opened the meeting by commenting on how much progress the committee has made in the four months since its first meeting. Ted summarized the last meeting which was held with representatives of the Scout Brigade of Fort George (see minutes for September 18). The group discussed the need for parking and admission passes for celebration attendees. It was generally agreed that the Fort George admission fee could be built into the event registration fee. It was suggested to arrange a special viewing area for the SBFG parade, such as in front of the courthouse. The group discussed the challenges of having a formal banquet. A banquet is difficult to organize if there is an uncertain number of attendees. One suggestion was a buffet catered by the Friends of Fort George. The group discussed who might serve as a keynote speaker for the event. Ideas include a WJ'55 attendee who has had a distinguished career or member of B-P's family. Another idea is to have many people give three minute vignettes about how Scouting and the Jamboree affected their lives. Bill C. reported on a meeting held with John Armstrong and Lou Cahill of OEB International, a public relations firm that worked on WJ'55. They are interested in assisting with marketing the event. They suggested using the celebration to renew interest in Scouting in general across Canada. John sent his regrets that he was called away at the last minute and unable to attend the present meeting. It is important that the committee soon publish a position paper of two to three pages describing who we are and what we are trying to accomplish. John has offered to review the copy. The position paper serves as the basis for getting the message out about the celebration. George and Tony will work together to get this written by the end of October. Tony is following up with the Scouts On Stamps Society International. He will discuss with them creating a souvenir stamp cover and cancellation. Ted will contact Murray Fried regarding spreading the word among the Badger's Club. Bill C. has met with Mike Scott, Chief Commissioner of Scouts Canada, and reports that he is very supportive. Bill asked for approval to use the WJ'55 emblem. Rob Stewart, Scouts Canada's CEO, has passed the request to the World Scout Bureau in Geneva. A liaison person has not been appointed as of the present meeting. Bill will follow up. Ted will contact Rob Stewart regarding an official statement of Scouts Canada's involvement and the use of the Scouts Canada emblem on the web site and will also contact Scouts Canada's International Commissioner, Tyler Arell. Mike Scott has offered The Leader Magazine as a means of communication. It was noted that many WJ'55 attendees will no longer be involved in Scouting and will not be reachable through The Leader. Eaton's commissioned a 16mm movie about WJ'55. The NOTL museum would like to use it as part of their exhibit. The holder of the copyright is not known. It is believed that Eaton's passed the copyright to Scouts Canada, Ontario Provincial Council. Today, neither Eaton's nor Ontario Council exist. Copyright is likely to be owned by Scouts Canada. Ted will follow up with Rob Stewart about this. Tony met with John Rietveld of the Scouts Canada Foundation who supportive. Ted will follow up with John regarding official approval. The Foundation has sent a notice about the commemoration in its Centennial Group newsletter (the Centennial Group is a new association for people who have earned the King's/Queen's Scout/Venturer or Chief Scout's Award). It has been generally agreed that any surplus from the commemoration event will go to the Scouts Canada Foundation. No specific amount can be promised. Liam showed a design for the commemoration crest. 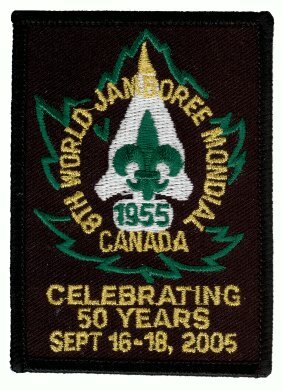 The proposed crest is identical to the WJ'55 crest except that the words "New Horizons Nouveaux" have been replaced with "Celebrating 50 Years / September 16-18, 2005". Liam also showed a design for a poster advertising the commemoration event based on the design of a poster used for WJ'55. The new poster is on the web site. Motion: Bill C. / Tony; Carried. That the proposed crest design be approved as the official crest for the WJ'55 commemoration. Peter Miller of the KW Scout Shop has much experience in arranging the manufacture of crests. Ted undertook to see Peter about having the crest made. It was agreed that the crests will be sold for $5 each with proceeds supporting the commemoration. The committee has received an invitation to visit Clive Buist, Director of Parks and Recreation for Niagara-on-the-Lake. He is supportive and would like know the tentative plans. Ted and Bill L. will arrange a visit. The group discussed the floral clock which is maintained by the Niagara Parks Commission. Tony has a colour photo of the clock from during WJ'55. Bill C. will contact the Commission about a display in the clock for next year. Bill C. spoke of the need for more committee members. There is much work to be done. Committee members need not be WJ'55 attendees. Anyone with an interest in the commemoration may be helpful. It was noted that there are many people who would be willing to help with specific tasks, but are not interested in committee work. The committee must be able to identify such people and delegate work.